I love talking about my research in schools. The curriculum is increasingly contested, as I wrote about in an Opinion piece for the Times in January 2012, when Mary Seacole was threatened with removal from the syllabus. I've also spoken at the Department for Education and on Sky News about what sort of history we should be teaching our children. The good news is that the history of Africans in England is mentioned in the new History GCSE module on Migration. I've recently appeared in a short video for BBC Bitesize The story of black migrants in England in Tudor times and contributed this page on African freedom in Tudor England: Dr Hector Nunes’ petition to the Runnymede Trust's new Our Migration Story website, which provides resources for schools. However, going out and visiting schools side-steps the political wrangling and takes the latest historical research straight into the classroom. Below are summaries of some of the talks I currently offer schools, but I'm happy to tailor a talk to your students' requirements. Contact me if you'd like me to talk at your school. Using plenty of images, I tell the story of Africans in Tudor England- what they were doing and how they got here. From John Blanke, the royal trumpeter and servants in aristocratic households, to sailors and independent craftsmen, I explain the wide range of occupations open to Africans in Tudor England. I then show how they got here, via Europe and the Caribbean as well as straight from Africa, explaining the global context of the Spanish Empire and the rise of the Spanish and Portuguese transatlantic slave trade and how this brought Africans to England through the privateering activities of men like Sir Francis Drake. 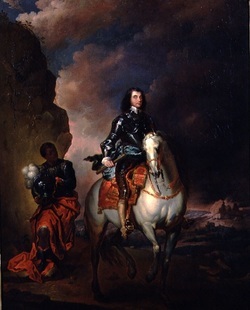 Oliver Cromwell and page by Thomas Wyck, c.1655-8. Using plenty of images, I tell the story of Africans in Stuart Britain, what they were doing, how they got here and how they were viewed in the eyes of the law. From the Africans at the courts of James I and Charles I and servants in aristocratic households, to sailors and those who were financially independent, I explain the wide range of occupations open to Africans in the seventeenth century. I then show how they got here, via Europe and the Caribbean as well as straight from Africa, explaining the global context of the Spanish Empire and the rise of the Spanish and Portuguese transatlantic slave trade and how this brought Africans to England through the privateering activities of men like Paul Bayning and piracy of men like William Longcastle. Finally, I discuss the legal status of Africans in Stuart England, showing that they were not considered slaves under English Law, but were paid wages, baptised and married in the Church of England and allowed to testify in court. “The presentation was superb and the girls said how fascinating it was to see how the fragments of research can be pieced together to make a coherent narrative.”- Howard Bailes, St. Paul's Girls School, January 2012. “The feedback from my students was really positive. They were engaged and enjoyed the talk very much. You had a good balance between pictures and stories. It's really important for the boys to be exposed to things that are outside their comfort zone. Maybe you will have sparked an interest in Tudor history or historical research!” - Catherine Turbett, Enfield Grammar School, November 2012. "my students want to start a hist soc to talk about things we don't normally do. Think your talk helped :-). "- Steve Theobald, Beauchamp College, Leicester, October 2013, via Twitter.